Dameware is a program that, put as simple as possible, allows a computer's outputs and inputs to be shared. In practice this technology is often used both for support based needs, such as end-user support or internal system support and repair, as well as for use in configuration and maintenance. Its one of the most (if not the most) versatile RMM software suites on the market as of 2019. On the one side it's quite a lot easier to show a user or co-worker a solution, or simply take control of the system and perform the fix necessary yourself rather than have to explain to them how to do it, step by step! On the other side being able to sit at one system while remotely configuring and setting up a dozen others massively increases productivity. Not having to walk all over a large office or campus can save a great deal of time! Remote control software, often just called remote software, is incredibly common and heavily used in today's computing environment. In a technological world built online it only makes sense to be able to share access and control in order to facilitate a range of both support and non-support needs. The program holds a suite of functionality for remote support, management, and general oversight of a network environment configured to work with it. 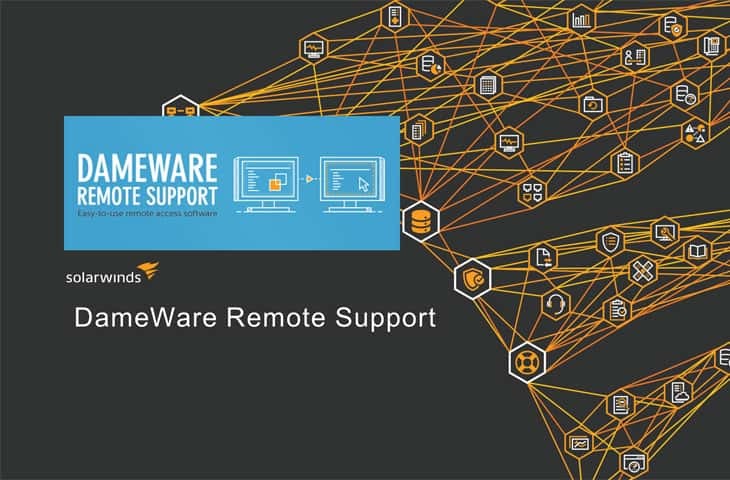 The entire suite is known as the “Dameware Remote Support” suite, or DRS. DRS has two basic methods for functionality. It can work directly from a direct client-to-server setup but it also has the ability to function over a centralized-server which allows for a remarkable level of ease in managing a huge range of computers, while also offering expanded functionality in managing and monitoring those systems! When installing Dameware in a centralized fashion there are three particular portions to bear in mind which need to be installed and configured, depending on the particular needs of the environment. The “Central Server” is, as the name implies, the basic server component for the entire DRS software. The “Central Server” is absolutely necessary in any centralized environment. 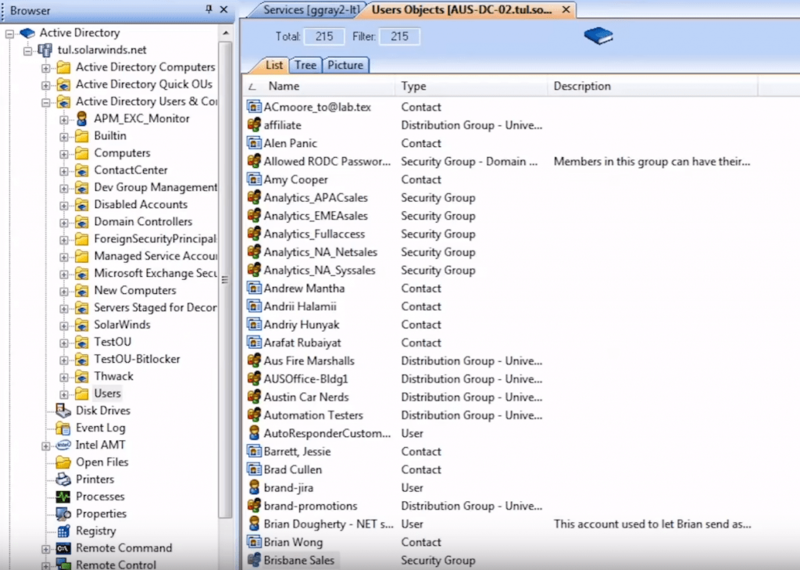 This component gives administrators access to setting up and configuring Dameware users, provides license management and inventory, host listing, current sessions, and so forth. The second component, the “Internet Proxy”, is generally only necessary when there will be remote support provided outside your firewall and internal network environment. It is recommended to install the Internet Proxy on a separate system from the Central Server and to setup this other system as a DMZ – which means, of course, that other precautions must be taken when setting up and configuring this particular system! Lastly, a third component is required for performing any sort of remote support with mobile devices, which intuitively enough requires the “Mobile Gateway” to be installed and configured. The stand-alone mode lacks some of the centralized functionality but is quite easy to install – DRS needs simply be installed on each of the user workstations to be supported. This does prevent centralized management of users, sharing of host lists, and loses the functionality of the Internet Proxy for making external connections easier. DRS has several modes for initiating remote and each one has its benefits and situational usefulness. The screenshot on the left shows the basic remote initiation screen, with all of its various options. The MRC Viewer is the most common and ideal option – it provides all the full functionality of the DRS with a wide swathe of tools and added features. However, due to compatibility or systems specifics some of the other modes may be necessary to use. The RDP Mode is the basic Windows RDP and, as such, sacrifices many of the advanced and expanded features of DRS. Even so it can be a perfectly fine option for providing basic support or making simple adjustments, or simply installing/setting up the DRS software so as to be able to start a proper remote! The VNC Viewer remote is unique in that it can connect to both Linux and Mac based environments to provide remote support. Most of the DRS functionality exists in this form. Finally, the Intel AMT KVM is a unique feature that allows a remote to be initiated to a system which is in a sleep, hibernating, or powered-off state, thus granting a wonderful extra tool for not being left out in the cold if a user turned off a system or in the event of power loss or other uncontrollable circumstances. It can even initiate systems which have experienced a crash at times, thus allowing for recovery even when you can't physically reach the machine in question! It's worth emphasizing that this even allows access to BIOS and boot menus remotely, which can be extremely valuable at times. This same window even allows you to customize encryption and security options, which also has full support for smart-card based authentication! Images and simple file transfers can also have encryption enabled, providing a greater level of peace of mind when dealing with systems which may have sensitive information on them. 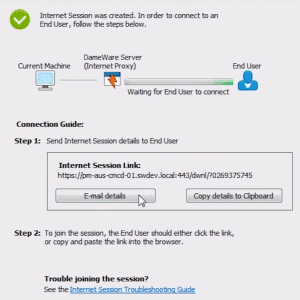 Making a connection via an “Internet Session” can be a little trickier than internal. It usually requires some sort of user-action to initiate the remote and, further, depends on a proper configuration of the Internet Proxy as above. Thankfully, there are several features of the Internet Session in DRS that simplify this. The connection details can be copied via clipboard and sent via internal messaging or other digital communication but, quite often, e-mail is easiest! It will draft and prepare a simple email with a direct link to the necessary page for the user system to initiate remote. As far as system compatibility goes, Dameware covers most of the major environments. The Server portion must be installed in a Windows environment, but functions in both server and non-server versions. Windows Vista, 7, 8, 8.1, and 10 are fully supported while Windows Server 2008 and 2012, including R2, are fully supported on the Windows Server side. The systems which can be connected to are extremely broad – any Windows system from XP SP2 and up can be remoted into, as well as Mac and Linux systems via the VNC Viewer for compatible systems. Additionally, support is also offered for iOS 6.x and 7.x, including tablets and other Apple devices running the proper OS, and Android 4.1-4.4! With screen share, even lacking remote control, the ability to provide support and feedback grows exponentially. Users don't have to rely on spoken directions to find what they need to find, and technicians don't need to rely on often-inaccurate descriptions by users who aren't sure of exactly what they are looking for. Once a remote is initiated Dameware has a large toolbar along the top which offers an immense range of functionality, the basics of which will be discussed just below! The most basic functionality of any remote software is, of course, screen sharing. 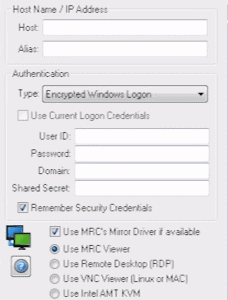 DRS supports, with encryption options, file transfers to and from systems over remote session. This can facilitate easily transferring patches, installers, utilities, or other useful files while, at the same time, making it easy to snag files from the remote system such as logs, crash dumps, or other helpful data. Instant messaging via remote is an especially useful feature when working a remote session without a user on the phone, or simply when it will take quite a while and there's no need to stay on the phone. Being able to simply drop a message and have it waiting (or for the user to do the same) can be a very convenient way to communicate while performing tasks via remote. As mentioned above DRS provides Smart Card support which provides an immense benefit – technicians can reap the wonderful time-saving perks of remotes without having to compromise security in the slightest. DRS can connect to both servers and workstations alike, meaning that support and management need not be limited to end-user. Servers at other offices or other important infrastructure can just as easily be managed remotely – and duet o the Intel AMT KVM you need not worry about having to perform a restart or reboot and losing remote, as it can be re-initiated through the console! DRS also provides Active Directory functionality in compatible versions of Windows – it can unlock user accounts, reset passwords, as well as create and edit users, security groups, and organizational units. Group policies can be edited and changed and DRS can even perform a broad export of AD settings into several formats, facilitating the easy mirroring of numerous complex settings. Sessions can be recorded, providing peace of mind for user and technician alike, while also offering excellent opportunities as far as oversight and further education and training goes. Settings exist to configure alerts and enact monitoring via DRS, expanding functionality further beyond just support and management. Many of the other buttons on the toolbar provide a great deal of other functionality as well – printing, screenshots, annotation, screen/keyboard/mouse lock, and more. Utilizing the centralized server for management provides a great deal of power from a single system with access to as many others as are configured for it. AD can be managed from this location, monitoring and alerts can be setup, and a great deal of functionality for automating daily tasks or scripts is also built in! There's an immense amount of power in DRS when setup to provide support and ease management to an environment, which is by no means limited to just Windows desktop computers. Thanks to the Mobile Gateway and VNC Viewer compatibility, even non-Windows systems are fully covered and available for remote support. Overall Dameware is a powerful utility with a great deal of functionality that can help any environment not only resolve issues and problems more quickly but also to run more smoothly the entire time, as well! Too often tools are singular in their purpose, when a little added functionality goes a long way. There is such a thing as too many cooks, of course, but DRS strikes an excellent balance between depth and breadth of features. Grab a Free Trial of DameWare and get it installed to test its Functionality!